Above, runners on the move at the 14th annual Turkey Trot for the Homeless on Sunday, Nov. 26 at Waveny Park in New Canaan. Below left, more than 400 runners get on their mark. Below right, racers head off. 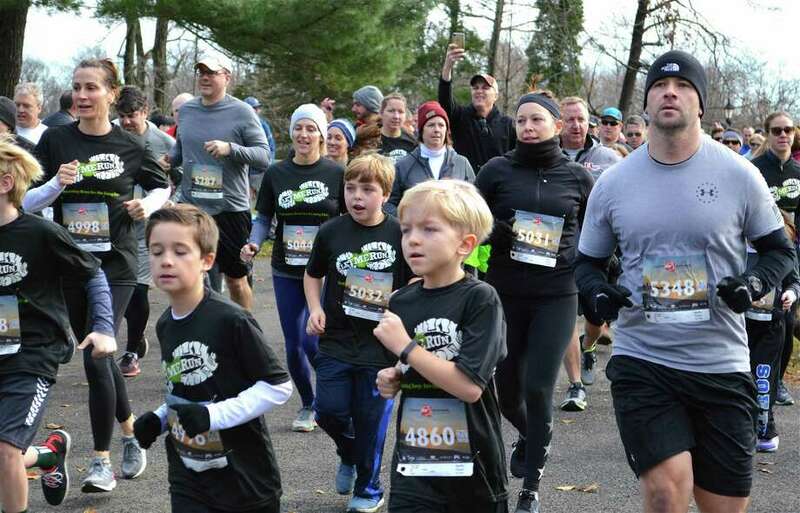 NEW CANAAN — Delayed a week because of snowy weather, the 14th annual New Canaan Turkey Trot for the Homeless enjoyed a spirited run at Waveny Park on Sunday morning. More than 400 people helped raise funds for the Norwalk-based Open Door Shelter, including over 200 from the LetMeRun.org group, which included dozens of elementary school students from Darien. Co-chairman David Tamburri, 17, of New Canaan, said what began as an informal walk among a few families 15 years ago resulted in more than $25,000 raised for the cause last year. “I think we’re definitely on par to make that this year,” he said.